About 5:15 this evening, local time, a call to prayer rang out from the mosque here in Weligama. The sound crossed the coastal road and its line of fish stalls and coconut palms, and headed toward the sunset over Weligama Bay. At sea level, I stood chest-deep in the surf, holding Phoebe as we played Up-and-Over in the waves of a newly arrived swell. An eagerly-anticipated swell after three days of six-inch surf. To our left, a beefy Russian dude paddled his heart out (unsuccessfully) in the hopes of catching a medium-sized wave, while a feisty blonde bolt of Surfer Girl breezed by. I’m proud to report that it was Holly, showing up that Russian, and that she topped it all off with a few soft steps up and down her board. Viva America! I wish I had a photo. So we’ve made it to Sri Lanka, the Resplendent Isle. Anywhere would require a bit of an adjustment after six weeks in India, and adjust we have done. The first few days haven’t exactly gone according to plan, mostly due to lack of a plan. We arrived at two AM to an apartment that weren’t even close to going to work, especially for two weeks. The rooms were like two furnitureless low-security prison cells, in a facility mostly housing pasty twenty-something Brits on an international mission to party. 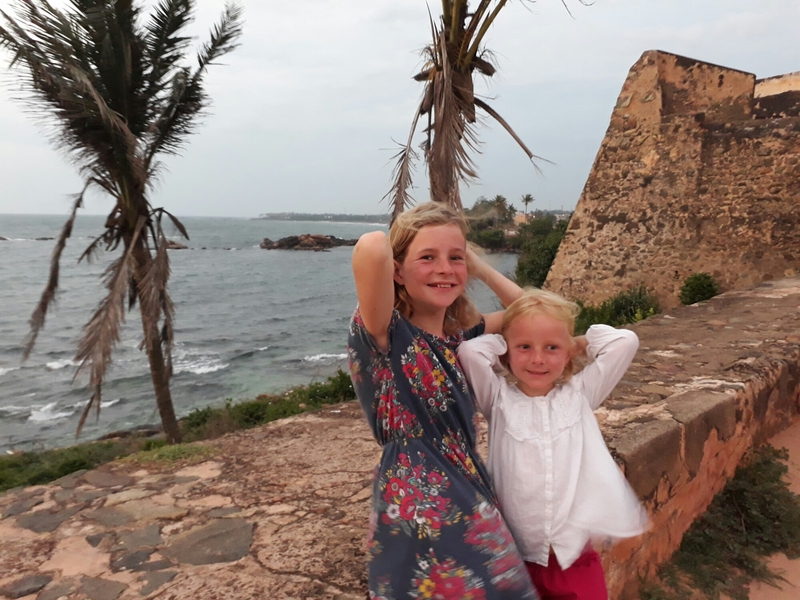 We also hadn’t really given much thought to how we would be passing our time in this new country, aside from an hour or two of surfing each day. 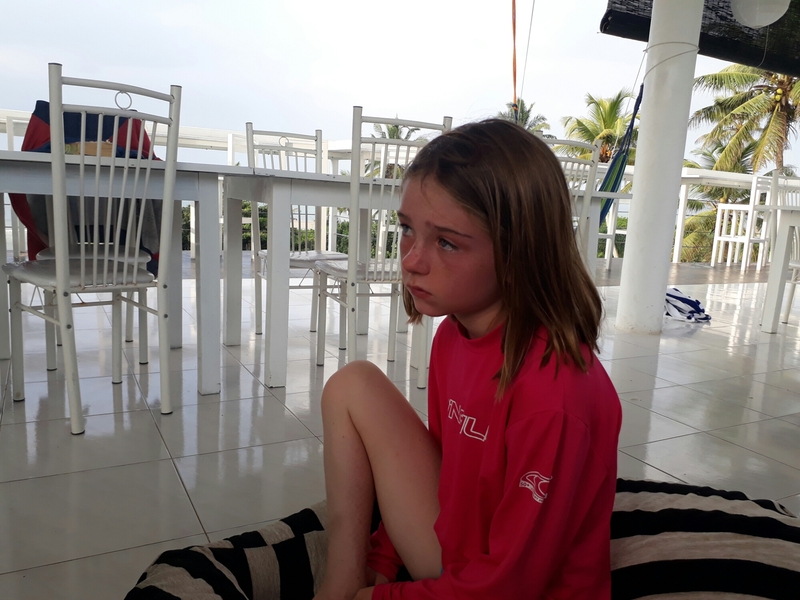 Morale ebbed and parental tension flowed as we scrambled for a plan B, residentially speaking, failing in the meanwhile to come up with any other agenda for our Ceylonese adventure. That, dear reader, is a recipe for trouble. As Alex and I have learned on this trip, lack of a plan, and lack of daily structure, can be murder. We’d like to think that our four charming and well-adjusted little people have learned from these travels that life isn’t always fun and games and gelato and elephant farms. The fact is, they have learned it, but it doesn’t keep the grump factor from escalating when we don’t have a satisfactory answer to What Are We Doing Next. They’re used to that question being answered primarily by school and sports, and we, in our wisdom, decided to travel the globe, in part, to see what happens when that’s all taken away. Such wisdom. Back to the matters most closely at hand – Alex crushed an emergency airbnb negotiation and got us into a very affordable beach house and we’ve settled into a routine of surf, school, siesta, kottu roti, and the odd cultural experience. There’s talk of finally dusting off our PADI cards for some underwater adventure. There’s even talk of renting our very own tuk-tuk, once we confirm that it won’t land us in a Sri Lankan jail for operating without a license. 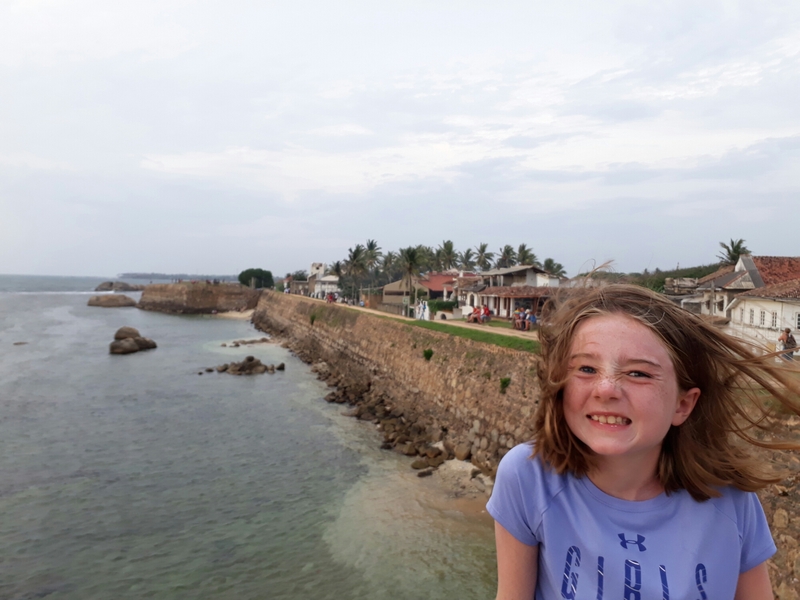 We had a great road trip last night to Galle, the local port city whose Dutch colonial ramparts withstood the 2004 tsunami (the rest of this coastline was basically destroyed). ^^^ That’s the Coco we all like to see, and I hope the frowny one pictured up above won’t be too frequent a visitor to the Isle of Serendipity. I should mention that she and William held their own quite nicely among the Russians in the lineup this evening, too. More of that to come, I have no doubt. What a brilliant description of life! Love the Russians being shown who is boss.